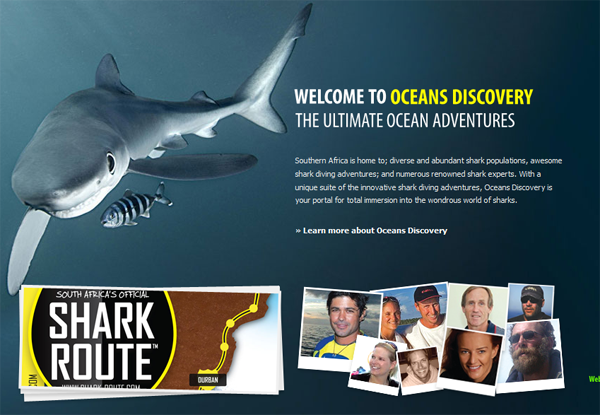 24 November, 2011: Mossel Bay — Oceans Discovery has launched the first ever Shark Route. Oceans Discovery has launched the first ever shark route along the coasts of Southern Africa; home to diverse and abundant shark populations and some of the most incredible ocean ecosystems our world has to offer; as well as home to many shark experts which recognize the importance of shark diving ecotourism as one of the most powerful tools available to aid in the conservation of the world’s threatened shark species. With ecotourism blossoming in South Africa tourists are now able to get up close and personal with some of the last apex predators on earth. Passionate about the well being and future conservation of the shark species, Oceans Discovery, a collaboration of a unique group of divers, tour guides, scientists, conservationists, and shark professionals have teamed up with a mission to pioneer unique shark diving expeditions that introduce humans to the world’s most remarkable species of sharks in a exciting but educational and respectful manner. Their aim is to harness the deep knowledge held by these professionals to allow clients to have a true insight into the wonders of South Africa’s sharks and the work that is currently being done to understand and conserve these vulnerable predators. The Shark Route consists of three zones. Zone 1 runs from False Bay to Tsitsikamma, with stops in Gansbaai and Mossel Bay; Zone 2 runs from Port Elizabeth to Durban with stops in Port St. Johns, Protea Banks and Umkomaas; and Zone 3 runs from Sudan to Tofu, with stops in Ponta, and Zavora. In these zones, guests will dive with some of the world’s most charismatic shark species including great whites, mako sharks, blue sharks, shy sharks, ragged tooth sharks, bull sharks, tiger sharks, hound sharks, whale sharks, grey reef sharks, manta rays, and the prehistoric seven gill shark. At each stop of the Shark Route, clients will spend an insightful evening with a dedicated shark specialist in that area. These evenings will consist of dinner, as well as a brief presentation, where any shark related questions will be answered by the resident specialist. Shark Scientist, Alison Kock has established herself as one of South Africa’s preeminent shark biologists following the spate of great white shark attacks in Cape Town. Confronted with the possibility of shark nets and culling Alison helped develop the successful ‘shark spotters program’ to keep swimmers safe from sharks. Shark Photographers, Chris and Monique Fallows, observe and photograph the breaching sharks of seal island in False Bay. These sharks have become stars of films such as, the Air Jaws series and Planet Earth. The films, posters, and photographs of breaching sharks that emanate from this unique Island can be credited to the knowledge and passion of shark ambassador, Chris Fallows. Underwater Cameraman, Morne Hardenberg, has stared down the gullets of more great whites than anyone else, with only his equipment to protect himself. His work brought us films such as; Sharkman, Great white shark – a living legend and Shark night. The Sharkman, Andre Hartman is the most famous of South Africa’s shark divers. Andre pushed all of the limits when he pioneered free diving with the Great White shark. Going where others feared, his feats are cemented in history by the likes of Discovery, National Geographic and BBC. Andre is South Africa’s original and most charismatic Sharkman. Shark Scientist Ryan Johnson has broken the mould of many shark scientists with his willingness and ability to get up close and personal with some of the world’s most feared sharks. His unique research has been featured extensively on documentaries such as National Geographic’s Sharkville. Underwater Photographer, Fiona Ayerst is one of Africa’s most celebrated and experienced scuba divers and underwater photographers. Named Fuji Film’s photographer of the year in 2006, her passion for sharks is evident in her work, with her artistry capturing many iconic shark photographs that has adorned magazines such as Diver and Submerge. Shark Scientist, Enrico Gennari, is an innovative shark scientist based in Mossel Bay. Enrico Gennari’s research into the thermal-physioecology of the great white shark has caught the attention of the world and in 2010 he was featured on the Channel 4 series – Inside Nature’s Giants. Shark Scientist, Dr. Matt Dickens, has been at the forefront of many of the top shark research collaboration efforts initiated in South Africa. Based in Port Elizabeth, he has published academic papers on shark species such as the tiger shark, great white shark, and ragged tooth shark in many of the world’s most esteemed journals. Shark Diver, Mike Frasier, is one of South Africa’s most passionate and experienced scuba divers. Mike resigned from corporate life to spend a life underwater. For the past 10 years, he has dived the coast of South Africa daily. Recently he made international news following a dive mishap that resulted in an eight hour swim to the mainland. Shark Diver, Mark Addison, is a maverick of the shark world, he pioneered Aliwal Shoal’s baited tiger shark dive and introduced the world to the Sardine Run. Through their company, Blue Wilderness, the Addison’s have hosted over 300 shark filming projects including BBC’s Blue Planet, Planet Earth and The Greatest Shoal on Earth. Shark Scientist, Dr Sheldon Dudley, is a chief scientist at Natal Sharks board. Dr. Dudley has been instrumental in ensuring that the impact of bather protection nets on shark populations is openly assessed through vigorous scientific standards. Shark Scientist, Geremy Cliff, is also a head scientist at the Natal Sharks Board. Geremy runs South Africa’s shark attack file, where his duty is to all shark attacks on humans. His work also includes the ecological impact of the shark netting program on populations of sharks and other marine species. Shark Conservationist, Grant Smith was exposed early to the horrors of commercial shark fishing as a young dive instructor on the Protea Banks. He went on to found SHARKLIFE, South Africa’s most recognised and active shark conservation society.